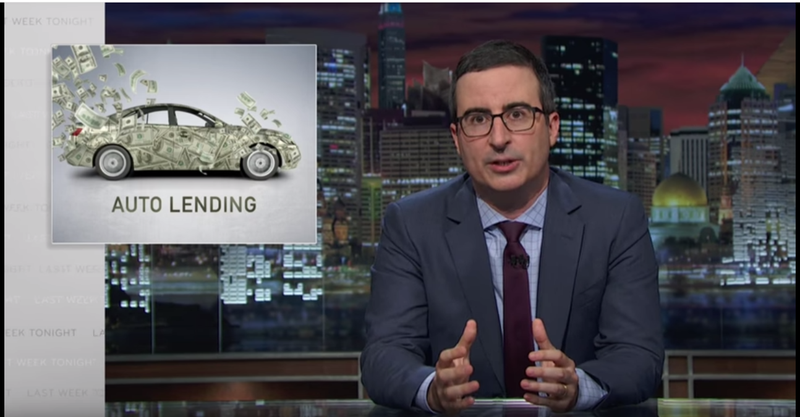 Last Week Tonight has a penchant for taking on scams and corrupt institutions, and John Oliver’s latest episode trashes the worst people in the world of cars: shady auto lenders who trap poor, desperate and often unwitting buyers in insane levels of debt. “No credit? No problem!” You probably see those car lots all over your city. During the recession and its aftermath, they experienced a tremendous boom in business by offering car loans to just about anyone with a pulse. But those lots are notorious for their staggering interest rates that force buyers to pay far more over time than their junky used cars are actually worth. And as Oliver also explains in this segment, they have a penchant for repossessing cars when just a single payment is late—and in one infamous case, with a kid still inside the car. But that’s only part of the equation. He then dives into the scary growing trend of “subprime car loans,” which seek to give higher-interest and longer term auto loans to people with financial problems or even bankruptcies. Even the big banks are getting in on those now. Yes, buyers should be more educated when it comes to the car purchasing process. But when sketchy car lots and banks alike are designed to be predatory, it’s hard to win. It’s kind of unlikely that a massive defaulting on bad car loans will tank the economy the way housing did in the late 2000s, but these practices are far from ideal, and they ruin a lot of lives in the process. The segment is worth watching to see how. Also, Keegan-Michael Key’s in this one, and that alone makes it worth it.